This is the first of nine outings for the character ‘Michael Lanyard’ a.k.a. ‘The Lone Wolf’ played by Warren William, a leading man in ‘pre-code Hollywood’ who continued to be prolific in the later 1930s and 1940s but who died aged only 53 in 1948. He’d previously played in a Warner Bros. series as ‘Perry Mason’ but this Lone Wolf series came from Columbia with each film running for around 70-80 minutes. This first film has the distinction of two female leads still in the early stages of what would later become ‘A’ list careers – Ida Lupino and Rita Hayworth. Both young women were 20 at this point, but both had already appeared in several films. Lupino was second-billed to William as she had more experience in leading roles than Rita Hayworth. I don’t know much about the director, Peter Godfrey, who was British and a former actor directing only his second film. Later some directors took on more than one title in the series. Edward Dmytryk directed two of the later ones. My research suggests that there had already been other ‘Lone Wolf’ films from other studios and this story actually dates from 1914, one of the eight stories written by Louis Joseph Vance (1879-1933). IMDb suggests that there were some 20 films in all plus radio and TV series featuring ‘The Lone Wolf’. There is a suggestion that Columbia gave this a slightly higher budget to cover the salaries of Lupino and Hayworth but in the event it turned out to be one of the shortest films in the series. I wonder if there were cuts? Michael Lanyard is an ex-saferobber who was once a kind of ‘gentleman thief’ in the mould of Raffles. He is now going straight and has been accepted in high society, so much so that he is dating the daughter of a Senator in Washington. This is Val Carson (Ida Lupino). Lanyard’s household includes a young daughter, Patricia (Virginia Weidler) and a butler Jameson (another British actor, Leonard Carey). The plot is a convoluted tale of crooks rather than ‘spies’, working for an oil millionaire who is attempting to steal the secret plans for an anti-aircraft gun. 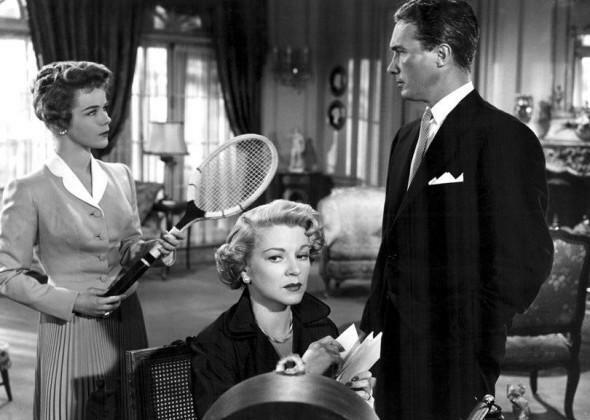 Lanyard is entrapped by a young woman, Karen (Rita Hayworth), and forced to open a safe where some of the plans are kept. The plot hinges on the plans being split into two parts, each of which is in a safe in a different location. Cue endless mini-chases as different envelopes are stolen and then taken back while The Lone Wolf is pursued by both the crooks and the police. I thought at first that it was going to work along the lines of The Thin Man and other comedy thrillers of the 1930s. The spy theme doesn’t appear to have any direct connection to the expectation of war in Europe which isn’t too surprising, though the British actors and director would presumably have been aware of events. It is certainly a ‘light’ and at times quite witty film. But Lupino is much younger than William who is twice her age. It is difficult for her character to match his sophistication (i.e. like Myrna Loy with William Powell in The Thin Man) and the script relegates her role to comic relief, much like the butler and the daughter. (The film was also released with the title The Lone Wolf’s Daughter.) 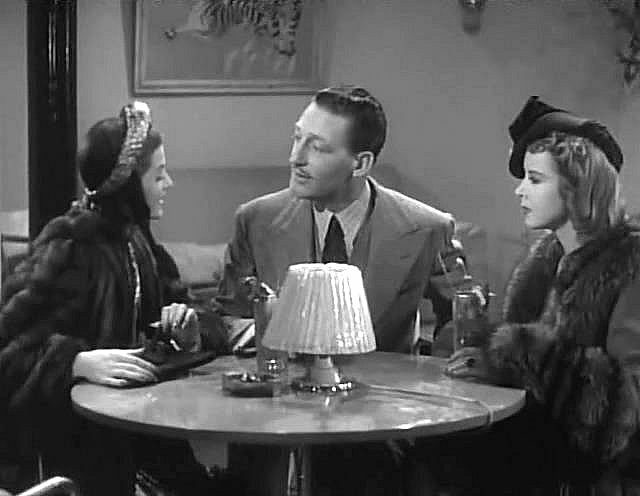 I understand that the girl playing Patricia was a prolific and well-respected child actor who the next year appeared in both The Philadelphia Story and The Women, but here she is a brat for much of the film only becoming resourceful in the final sequence. Columbia must have come to the same conclusions about the casting because for the remaining eight films they cast different female leads, changed the butler and dropped the daughter. My main concern with the film is Ida Lupino’s participation.The film came at the point when she had left Paramount and was working freelance. She must have been concerned about her income and responded to Columbia’s offer even though she was in the process of marrying Louis Hayward in November 1938 when the shoot began. In one sense it is odd in that she presumably thought of the film much as she did some of the other ‘B’ pictures that she had appeared in as a loanee from Paramount. On the other hand, the comedy element may have been attractive. The blog by Cliff Aliperti referenced above suggests that the comic elements were not there in the original stories and that Warren William brought them with him from the Perry Mason series – an intriguing suggestion as I don’t remember any comic elements (apart from a few smiles and nudges) in the books or the later Raymond Burr TV series. But then Aliperti argues that Ida Lupino can’t play comedy and he describes her performance as ‘cartoony’ and zany (while saying that he admired her performances in the early 1940s when she stepped up to ‘bigger pictures’). These are interesting comments, especially put against other commentaries on later Lupino films. Ida Lupino was often described as ‘intense’, both in her performances and sometimes in her off-screen behaviour. At the same time she was a talented actor with an unparalleled range of performance skills learned within the Lupino family set-up. She could do comic timing and she had the skills for slapstick. Aliperti points to a piece of ‘comic business’ she does with a knife when interrogating a woman she thinks is a rival for Michael’s affections. 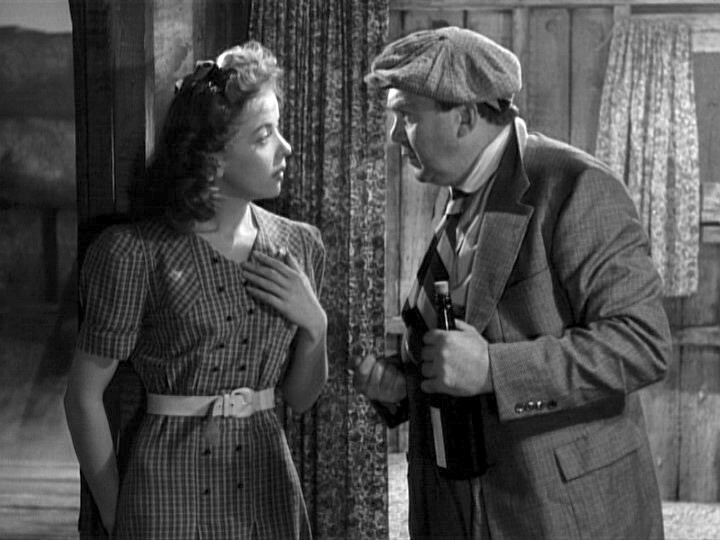 Ida Lupino did appear in a full-blown Warner Bros. comedy, Pillow to Post (1945) in which she plays the daughter of a businessman, trying to make a contribution as a travelling salesperson and discovering how difficult it is to find accommodation in wartime – and having to share a room with a man. Several commentators attest to Lupino’s skills in pulling off this kind of farce/screwball comedy, expressing surprise that she wasn’t used more often in this kind of role. 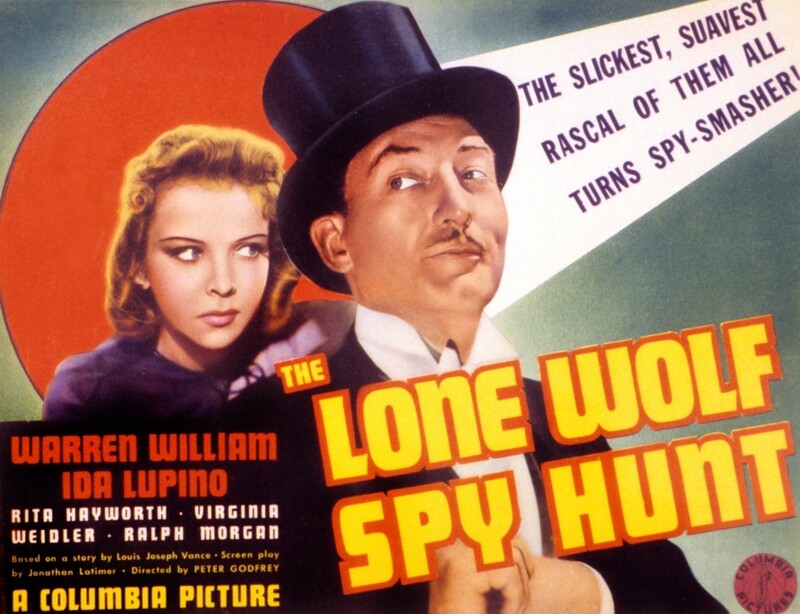 I haven’t seen Pillow to Post (her Warners films are difficult to find in the UK) but I enjoyed her performance in The Lone Wolf Spy Hunt. In this mode Ida comes across as a ‘trouper’ (which I’m sure she was) willing and able to have a go. 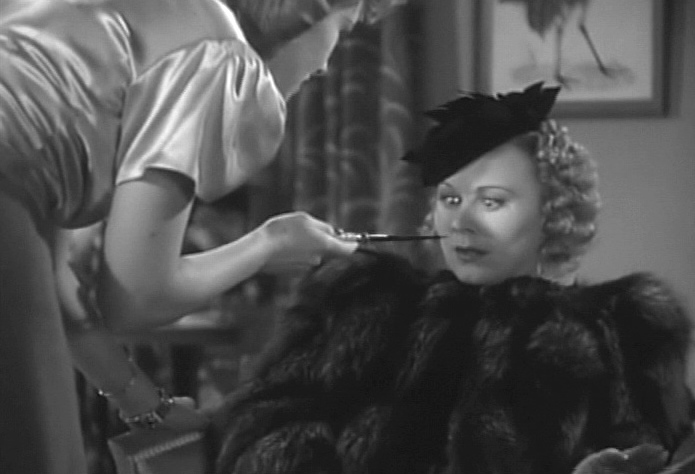 She handles a baseball bat as a weapon with as much skill as she wears a mink stole. 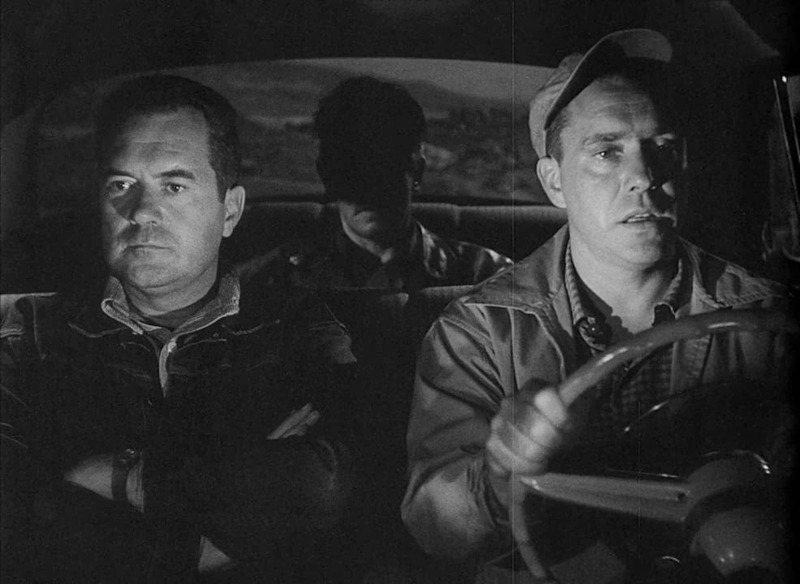 This would be the last time Ida Lupino appeared in a B movie but the interesting trivia point is that Louis Hayward played The Lone Wolf on TV in the 1950s, by which time Ida Lupino was in her third marriage having divorced Hayward in 1945. This odd film offered Ida Lupino a lead role that paid the bills as she was preparing projects for her new production company now that her Warner Bros. contract work was completed. Her new husband Collier Young was a producer at Columbia and according to Lupino’s biographer William Donati she hoped that by choosing a Columbia script she would at least see Collier on a regular basis. However, Lust for Gold was a location shoot in Arizona for much of the time. 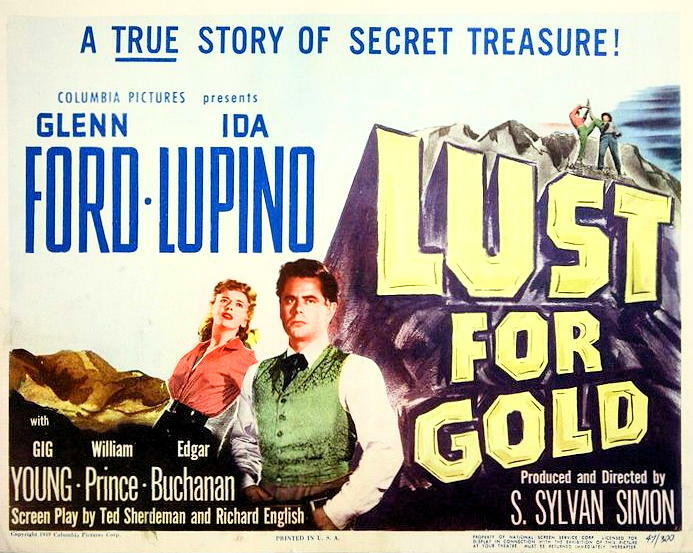 Lust for Gold, as the title baldly suggests, is a story about a real life mystery – a ‘lost gold mine’ on Superstition Mountain in Arizona – and the people who will go to any lengths to find it. In fact, this is arguably the most often quoted ‘lost treasure’ story in the Americas with many references in American popular culture and the development of what is now a mythical story based on ‘real’ events. 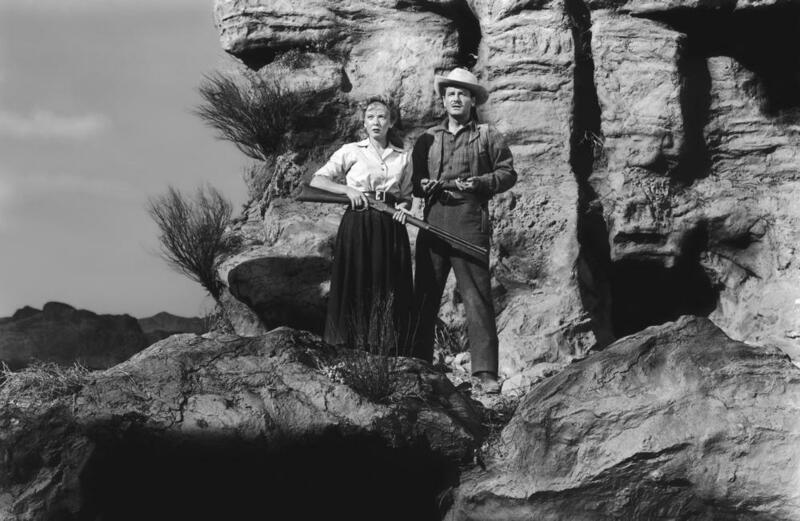 The script embraces the mythological/real basis of the ‘Lost Dutchman’s Mine’ by setting the story in the present and revealing the original events as a Western narrative via a prolonged flashback. In the present, ‘Barry Storm’ (the pen name of the writer of a 1945 book about the myth) travels to the mountain, claiming he is a descendant of the original ‘Dutchman’, the German migrant Jakob Walz. 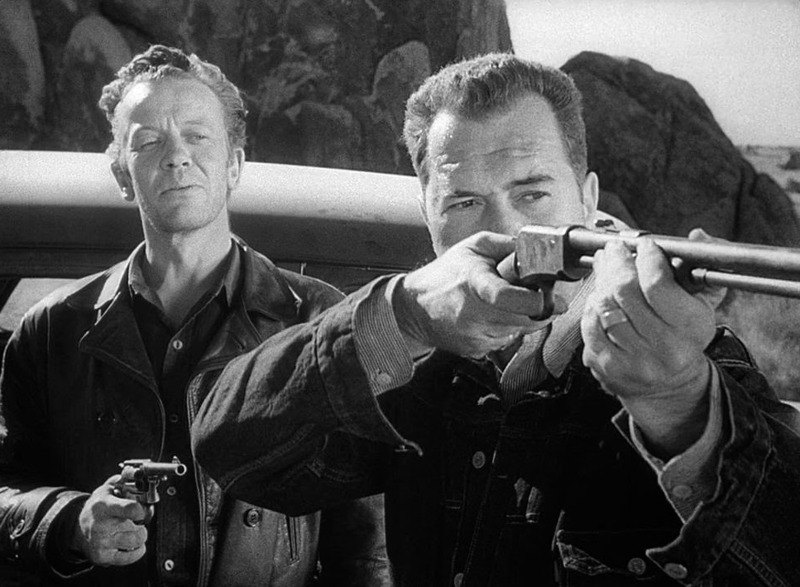 Storm is involved in a shooting on the mountain and encounters the local sheriff and his men. 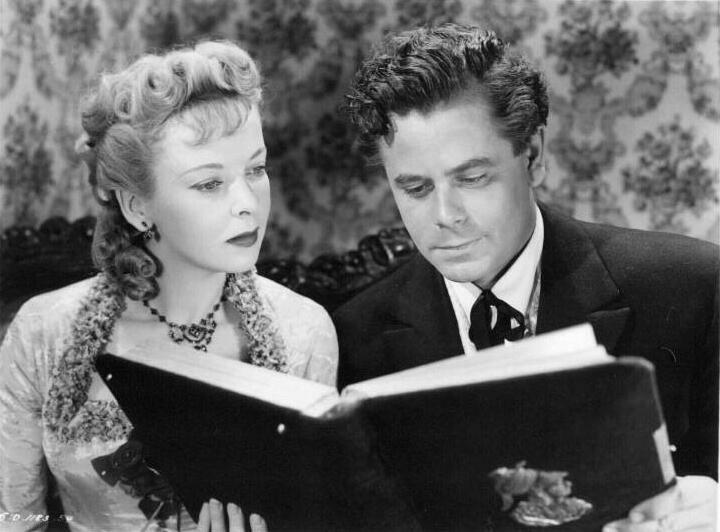 With what the sheriff tells him and further research in newspaper archives of the 1880s and talking to elderly locals he pieces together a possible scenario – which leads into the flashback with Glenn Ford, Columbia’s go-to leading man for this kind of film. He plays Walz who finds the original mine and then hits town where Ida Lupino is Julia Thomas, from a German family in Milwaukee and who runs a small bakery shop. Julia is married to the spineless Pete (Gig Young) but she sees an opportunity to seduce Jakob and find the gold for herself. It’s a risky business as the whole town knows about the find. What follows is a classic Western melodrama which ends in disaster and takes us back to the present where Barry Storm becomes involved in a typical Hollywood ‘resolution’ that maintains the integrity of the ‘lost gold’. I need to admit that at times this is very serviceable entertainment. At other times it threatened to lose my interest. The film was originally intended to be directed by the highly experienced director George Marshall but when he was not available it was passed to S. Sylvan Simon who was arguably better known for comedies. It turned out to be Simon’s last film as director as he died suddenly aged just 41 a couple of years later. 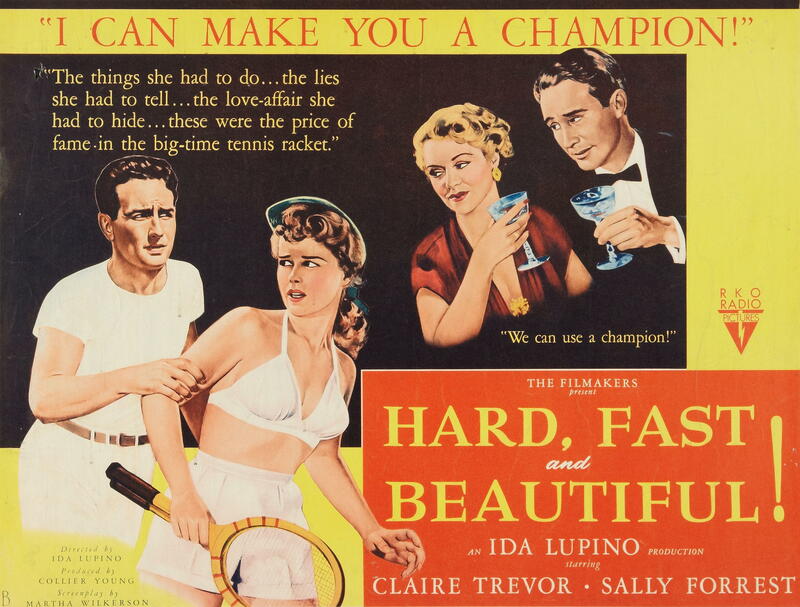 Ida Lupino gives a committed performance as usual and the other leads are fine. Glenn Ford with beard and unruly hair certainly looks different and his character is vicious, even by the standards of later Westerns. Several of the minor players are of interest, including Jay Silverheels as a sheriff’s deputy in the contemporary-set scenes. For children of my generation he was ‘Tonto’ in The Lone Ranger series on TV and, as the sheriff, Paul Ford is fondly remembered as the commanding officer trying to keep Sgt. Bilko in check in the Bilko/Phil Silvers TV series in the 1950s. For Ida Lupino this was one of the films she worked on with Archie Stout as cinematographer. 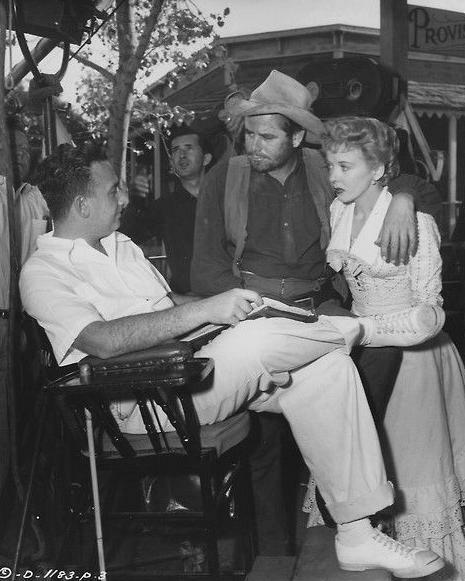 Stout, like other crew members was impressed by the way Ida stayed out on location in the blazing sun in order to see how the production functioned rather than heading back to town as soon as her scenes were completed. 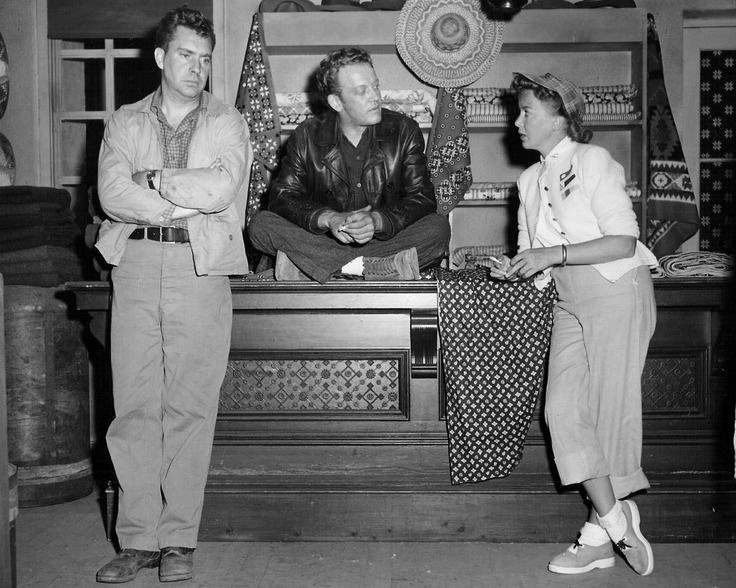 Stout would become one of her own loyal crew members happy to tell anyone who asked that Ida Lupino knew more about angles and lighting than most of the directors he worked with. 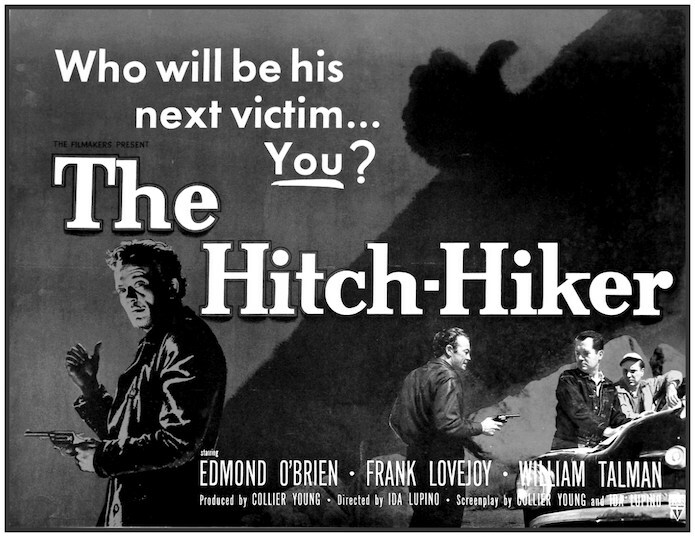 Certainly, the experience on Lust for Gold must have been very useful when The Filmakers were shooting on location in similar terrain for The Hitch-Hiker in 1953. This year’s Glasgow retrospective strand is devoted to Ida Lupino as Hollywood star and director on the centenary of her birth. Given the structure of the programme, I could only catch one of the screenings. I was happy though because it was a film in which Ms Lupino appeared as a twin lead with Jean Gabin in his first Hollywood role. I was then knocked back to discover the ‘troubled’ nature of the production – but as Alan Hunter observed in his introduction, the film has been gradually exonerated over time. I thoroughly enjoyed it and thought it had many fine features. Moontide was screened from a National Film Archive 35mm print which seems to be in pretty good nick. It was a 20th Century Fox production for Mark Hellinger initially to have been directed by Fritz Lang who jumped ship after a few days of shooting to be replaced by Archie Mayo. Hunter suggested that Lang and Gabin were at odds over their interest in Marlene Dietrich. Archie Mayo proved to be a ‘safe pair of hands’ and with a script by John O’Hara from a novel by Hollywood actor Willard Robinson, a fine cast got the chance to shine. Ida Lupino was often suspended by Warner Bros and therefore available for loans and that is presumably why she ended up starring alongside Thomas Mitchell and Claude Rains as well as Gabin. I have to agree with Alan Hunter, however, in picking out the cinematography by Charles G. Clarke (which received an Oscar nomination). The plot involves Gabin and Mitchell rolling into a small Southern Californian port as a pair of itinerants looking for work (or more accurately a fast buck). Bobo (Gabin) gets roaring drunk (a drunken binge celebrated by an expressionist sequence with the remnants of Salvador Dali’s work on the picture) and next morning there are clues to his possible involvement in the murder of an old sailor. Did Bobo do it? Meanwhile ‘Tiny’ (Mitchell) wants the pair to head north to San Francisco where work is more plentiful. But Bobo saves a young woman, Anna (Lupino), from the waves and seems to want to set up house with her. 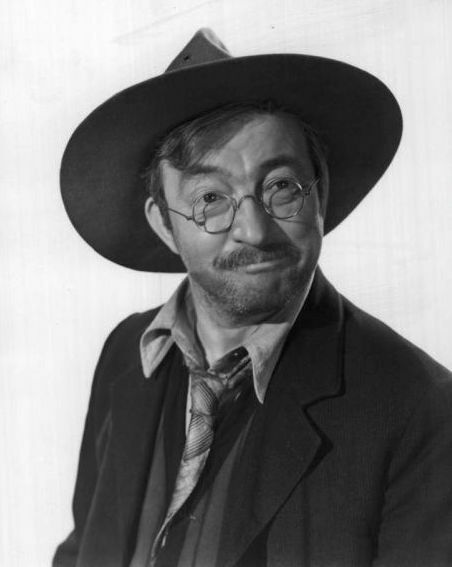 ‘Nutsy’ (Claude Rains), as a kind of ‘intellectual night-watchman who never sleeps’, becomes an all-seeing guardian angel. It sounds nonsensical, but Clarke presents it as a Hollywood take on the ‘poetic realism’ of Gabin’s films with Carné and Duvivier in the late 1930s and, not surprisingly, the film has been hailed as an early Hollywood noir. 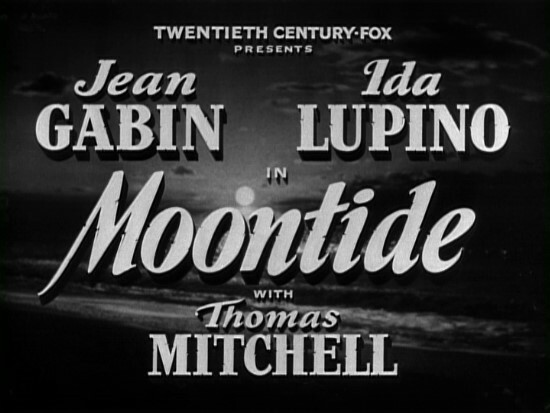 Gabin and Mitchell make typical show-stopping entrances into the dockside bar at the start of the narrative but Lupino is not outshone and her gamin character has plenty of vim as well as a radiant beauty in a tawdry environment. She was only 24 when she made the film, but already a veteran of British and Hollywood cinema having started at 15, I’m going to have to go back and re-watch some of the classic Ida Lupino flicks. They would include High Sierra (1941) and They Live By Night (1940) both with Bogart (and both produced by Hellinger) and the later Nick Ray film On Dangerous Ground (1951) with the always dangerous Robert Ryan. Towards the end of her film career, she was Steve McQueen’s ma in one of my favourite melodramas, Sam Peckinpah’s Junior Bonner (1972). Lupino’s centenary was the prompt for the retrospective, but the current outrage about the lack of directing opportunities for women in Hollywood has pushed the Lupino celebrations way up the agenda. In the late 1940s and early 1950s as the studio system began its slow descent into obsolescence, Lupino became the only female feature director of the period and eventually directed six features. She also went on to direct many TV episodes in the 1950s, ’60s and ’70s. IMDb lists over 100 acting credits – not bad for a girl from Herne Hill, South East London, though she did go to RADA and had the support of an acting family with centuries of work behind it. I must also praise the work of Gabin. What a great star and what a shame he made only one other film in Hollywood (which I haven’t seen but must look for). Mitchell and Rains are terrific character actors. Gabin and Lupino are stars.